The concept of running intensity was introduced in a previous article on Volume, Intensity and Frequency, and I would like to explore training intensity in more detail. If you are not having any specific coaching as a runner, you may not be sure about how hard you need to train to achieve your goals, or the different types of training sessions that are available to you. Some runners may train too hard, and too frequently, which will increase the risk of injury and burn out…. other runners may not train hard enough in specific sessions because of lack of information/knowledge. Just to recap, there are several ways to measure intensity in a training session. I briefly discussed Rating of Perceived Exertion(RPE) and also using Heart Rate max(HRmax) to determine how hard to train in the previous article. There is another excellent way to measure intensity and to work out how hard to train to achieve your goals. This method was developed by American professor of physical education, running coach and doctorate of exercise physiology Jack Daniels. Daniels, together with his colleague Jimmy Gilbert, studied the performances and VO2max(max volume of oxygen/ml/min that can be supplied to working muscles) values of elite middle and long distances runners in the 1970s. Despite having differing VO2max values, Daniels and Gilbert grouped athletes together on their performances, and assigned new values according to their aerobic profile. This value was called VDOT, and they tested it to be a more reliable predictor of performances and training paces as it accounted for differences in running economy, biomechanics and mental toughness of athletes, and not just VO2max measures. So, using Jack Daniels’ calculation formula and tables, if you know a recent race result, you can work out your predicted times over other distances and also training paces. But remember, these values were determined from elite athletes, so there may be some differences when extrapolating data from these tables, particularly when extrapolating up in distance. For example, a recent 5km race result for me was 21:06. Using the tables, it is suggested that my half marathon result would be 1:36:59 and marathon would be 3:21:40. My best half to date has been 1:40:10 and best marathon thus far 3:47:22, so these are a bit off, but perhaps what I may be capable of if I was highly trained. My VDOT based on the 5km is 46.8, but if I used my half marathon time it would be 45 and my marathon prediction would be 3:28:23. I feel this latter prediction is a little more achievable! Once you’ve calculated your VDOT value, you can then determine what pace you should aim for within different running sessions. At 65-79% of max heart rate (HRmax),this non-straining intensity is used for recovery runs, warm-up,cool-down and long runs. The primary purpose is to build a base for more intense workouts by strengthening the heart and increasing the muscles’ ability to use oxygen, and to recoverbetween hard workouts. Daniels recommends that most training miles are performed in E pace. Typical E runs include continuous runs up to about 3 hours. At 80-90% HRmax, this intensity is primarily aimed towards runners training for the marathon.The pace is one at which the runner hopes to compete. M-runs are performed as continuous runs up to about two hours, or as long interval training. At 88-92% HRmax, this intensity is aimed to raise the lactate threshold(the pace beyond which you will be training in the anaerobic zone). 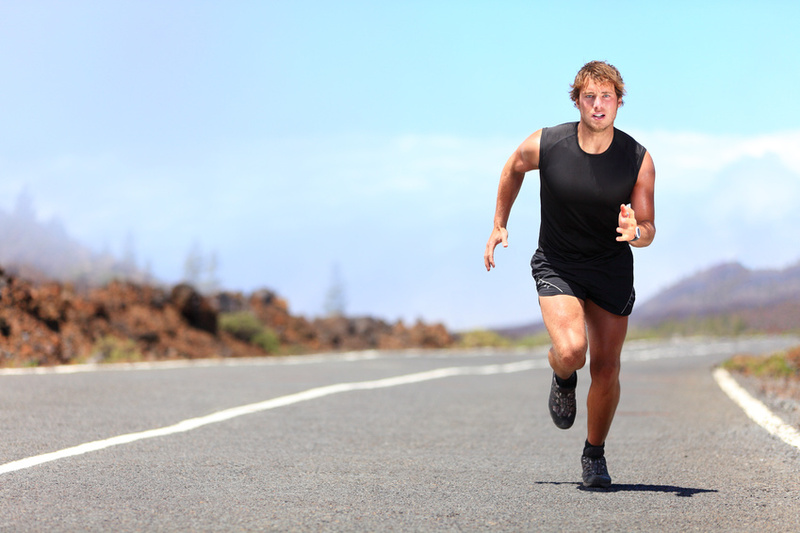 The runner should be able to sustain this pace for up to 60 minutes during racing. Daniels describes this intensity as“comfortably hard”. In elite runners, the pace matches the half marathon one, while less trained runners will run at around 10km pace. T runs are typically performed as continuous “tempo” runs for 20 minutes or more, or as “cruise” interval training with 3 to 10 long bouts of about 3 to 15 minutes each, having 20%-25% rest intervals in between. “T” runs of longer than 20 minutes can be done at slightly reduced pace, according to a table in his book. No more than 10% of the weekly miles should be run in T pace. Intensity at 98-100% HRmax. This intensity stresses the VO2max to raise the maximum oxygen uptake capacity. Since the pace is very intense, it can only be sustained for up to 12 minutes during racing. To cope with the intensity, and to train for longer periods of time, this training is performed as interval training, hence the name. The interval between each work bout should be a little less than the time of the work bout. Optimum intervals are 3–5 minutes long. For example, an I session can be 6 x 800 m at I pace with 100 m recovery jogs. At most 8% of the weekly training miles should be I pace. Hope this helps with your training. You can access the Daniel’s VDOT calculator here. It works out all your training paces for you. Have a go with it…. it’s quite helpful.